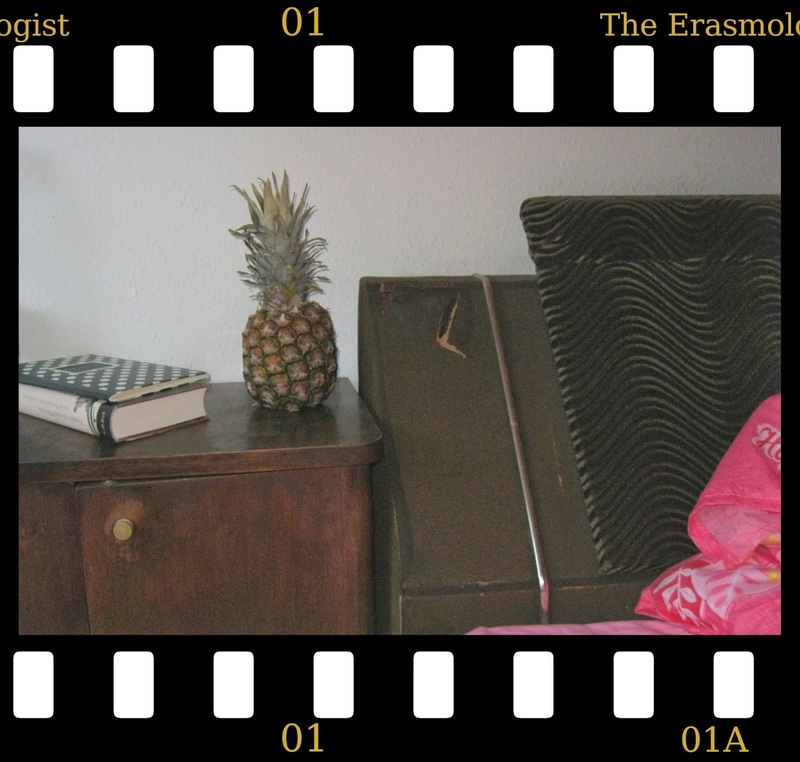 The Erasmologist: Are we one generation? After three weeks and many notices about my possible 'picky-ness', I found an amazing apartment and two amazing flat mates. Of course we had to celebrate this immediately and invited everyone we know for a housewarming party. We even got some housewarming presents! Next to shot glasses and bread & salt we also received... a pineapple. The thoughtful bearer of this gift was a Polish friend of mine who had two reasons to bring a pineapple. Firstly, she wanted a nice gift for us and stumbled upon a pineapple in the supermarket. Then, she thought about this one episode of the US series "How I met your mother". The pineapple on my nightstand. I have watched some episodes of "How I met your mother" while it was hyped in Germany, but I've never been a huge fan of it. Anyhow it made me feel some familiarity to be reminded of a TV series that has been part of many of my conversations in the past. Apparently I have missed the most famous episode though, which is called "The Pineapple Incident". In this episode, the main character Ted finds himself in his bed next to a girl he doesn't know, a pineapple on his nightstand that he doesn't know anything about and a sprained ankle. In the course of 20-something minutes he finds out what happened during the last night, but never finds out where the pineapple came from. Several people I told about the pineapple referred to this episode, which really made me curious. As a matter of fact, "The Pineapple Incident" is "the highest viewed episode in season 1 and currently the highest overall episode during the nine seasons of How I Met Your Mother" (source: http://en.wikipedia.org/wiki/The_Pineapple_Incident). And here's the next thing: For my birthday party on Sunday, I decided to have a Harry-Potter-theme-party after joking about it for several weeks. Guess what - none of the various people I invited could not relate to it. They all knew several books or films and were familiar with the overall setting of the story. The Erasmus students I have met so far and befriended are roughly the same age - somewhere between 19 and 28. Does this and the fact we have a common media socialization make us one generation? The term 'generation' is a highly controversial one. At this point I will only talk about societal generations (distinguishing it from the 'familial generation' as proposed by Künemund/Szydlik 2009). Of course any talk about a specific generation must be regarded as a social construction - there is no such thing as officially labeled generations. Anyhow, talking about a generation can be of historiographical use. With reference to the social background and some rough time specification, one can - in parts - describe the habitus of a large group of people. This gives also the chance to compare generations to characterize societal changes. In a common picture, we, the Erasmus-students of this year, would probably belong to the late children of generation 'Y'. Also called 'millennials', authors would depict us as more narcissistic, but also more 'civic-minded' than generation X. Other attributes ascribed are confidence, tolerance and entitlement. Our values, attitudes and behaviors differ from those of previous generations "as a response to the technological and economic implications of the Internet" (http://en.wikipedia.org/wiki/Generation_Y - very nice for an overview of the discourse). This is a rather unspecific picture of people our age, and there is huge room for speculation. For now I find the fact interesting, that we have a lot of media-experiences in common, be it Harry Potter, How I met your mother, or the use of social platforms on the Internet. Our socialization might be alike in several instances. For me, this shapes comfort and relatedness. But on the other hand, those common interests also reflect the results globalization - a process that results in an increasing amount of worldwide underdogs, too. It is hard to tell, what 'our generation' is like. I am not the one to tell you what our generation is about. Besides my first thoughts, maybe this poem can deliver a good picture of the difficulty of describing 'us'. Written by a 14 year old boy it went viral on the internet. 'Our generation' by Jordan Nichols. Künemund, Harald / Szydlik, Marc (2009): Generationen: multidisziplinäre Perspektiven. Wiesbaden. Howe, Neil / Strauss, William (2000): Millennials Rising: The Next Great Generation. Vintage.